The Salva-Vida corner protection range made of high quality polyurethane for the Steel Fabrication, Transport and Industrial Sectors and all Allied Industries. The unit(s) protect all painted, galvanised, stainless steel and aluminium from scuffing and scratching. The unit(s) prolong the life of lifting and load-securing equipment; i.e. Webbing Slings, Chain Slings & Steel Wire Rope Slings. The attachment chain may only be used as an attachment accessory without edge protection if a 20% reduction in load lifting capacity is taken into consideration or if the next-largest chain thickness is used. A “sharp edge” exists when the edge radius is smaller than the nominal thickness of the lifting chain. Further information is available in the “sharp edge“ chapter. 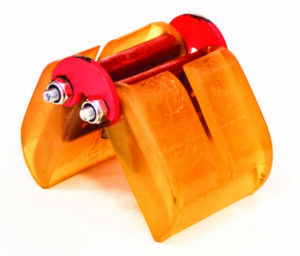 By means of a hinge, the edge protector can be optimally suited to fit any load geometry. It can be optionally equipped with magnets to better retain its position on the magnetic load. The edge protector can be quickly secured to the edge of the lashing belt by means of mounting slits. 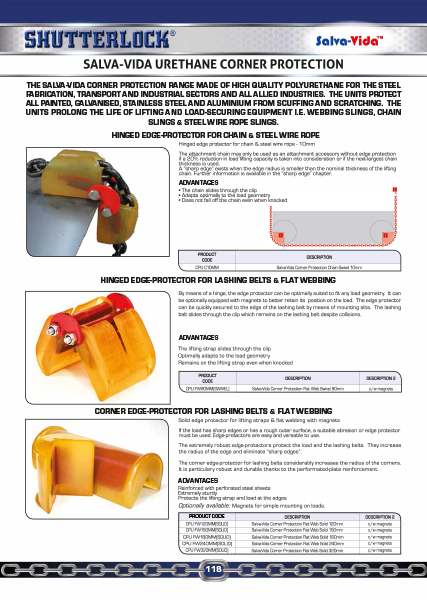 The lashing belt slides through the clip which remains on the lashing belt despite collisions. If the load has sharp edges or has a rough outer surface, a suitable abrasion or edge protector must be used. Edge-protectors are easy and versatile to use. The extremely robust edge-protectors protect the load and the lashing belts. They increase the radius of the edge and prevent “sharp edges”. The corner edge-protector for lashing belts considerably increases the radius on the corners. It is particularly robust and durable thanks to the perforated-plate reinforcement. 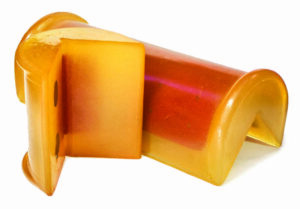 An optional magnetic version can be easily attached to the magnetic load. Optionally available for: Magnets for simple mounting on magnetic loads.